Gina emailed me and asked how our boy was doing. That was nice of her. He’s doing great. I just walked him and Gabby around the block. Hoshi is still getting used to the leash. I get dizzy watching this dog sometimes. He’s everywhere all at once. Hoshi wants to play with Gabby. Gabby doesn’t want to. He gives Hoshi a loud WOOF: Translation: Go away kid. You bother me!. He has a cute puppy voice–little yawns, cries, and growls. He loves to wake up Gabby from a sound sleep. We’ve been confining him to the family room and kitchen so Gabby can get some rest. Hoshi must be part PIRANHA. Those lil teethies are busy 24 hrs a day. He gave me a love bite on the ear a few days ago. 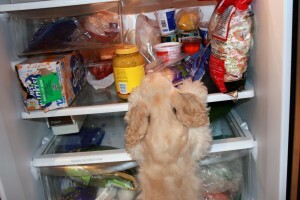 Hoshi just showed up at the refrigerator one day. I took a picture of him. He wants the shredded cheddar cheese. Hoshi is getting better with the crate. He whimpered a little when I put him in last night but dozed off shortly after. We’ve been giving Gabby some rest time by using a pet gate. I think Hoshi is settling down and not so excited about Gabby. Last night, I was on the floor watching TV with Hoshi sleeping on my right and Gabby on my left. The baby did very well last night. He cried once. I got up and took him potty. He didn’t cry after that. I woke up this morning and Gabby was sleeping next to his crate. Hoshi’s been itchy but doesn’t have fleas. We have 2 cats and 2 other dogs. Everyone was treated last month with Frontline. We’ll keep an eye on him and see if his itchies get better. Hoshi spends most his time with my mom in the family room. It’s been a quite Sunday here. PS: The cats and other dog belong to my mom. Beanie, my mom’s dog, practically lives in his dog bed. Yesterday afternoon we picked up Hoshi from Gina’s. Hoshi was all over Gabby the moment they met. The car ride was bumpy and Yoshi cried most of the way–peed himself too. Cathy just fell in love with Hoshi the moment she saw him. My mom really likes him too. She’s been spending a lot of time cuddling him. I think it’s good for her Alzheimer’s. Gabby’s feeling a little left out. I think he notices all the attention Cathy is giving the puppy. We made it up to Gabby by taking turns and scratching his rump which he loves. We’re crating Hoshi which we are not used to. I figured he would cry all night his first night away from home. He cried some last night but eventually stopped. Today I woke up this morning and Gabby was sleeping next to his crate. I took Hoshi for his first walk today with Gabby. We walked past a house with big dogs barking their heads off. Hoshi was scared. Gabby didn’t even flinch. Gabby peed on them. Hoshi is learning to walk on a leash. Gabby wanted to go on a marathon but Hoshi wasn’t feeling good about it–all the new surroundings, dogs barking and dealing with a leash. I turned around and brought them home. Hoshi follows Gabby around like he’s a leader. I brought home an electric bouncing ball which Hoshi loved. He barked at it and jumped up and down but was afraid to attack it. Gabby viciously attacked it as soon as he saw it. I think Hoshi was impressed. Hoshi prefers Gabby’s prescription hypoallergic kibble to his own puppy chow. Gabby prefers Hoshi’s puppy chow. 😛 It sounds like a heard of antelopes in the house. Hoshi is practicing his speed trials in the hallway. The vet’s office called back and let us know his heart worm test was negative. Last year, Gabby came up positive. Maybe cause I started him so late or maybe I forgot a month. Last year was a complete fiasco. His cardiologist wanted him to have the heart worm shot. His regular vet said he was an old dog and would probably die of something else before heart worms. Well, Gabby had the heart worm shot and almost died. I had to rush him to OVRS because Gabby was about to stop breathing on me and his regular vet didn’t have a clue. Gabby spent the weekend in their ICU on oxygen and IV fluids. OVRS even called at one point and told me it didn’t look good asking me what to do if Gabby stopped breathing. Gabby pulled through and NO MORE HEARTWORM SHOTS. The office also said the BUN was 50. That’s high but they said it was just about the same as last time and they weren’t concerned as long as he was doing well.